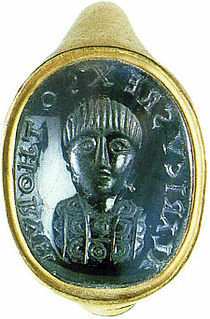 Alaric I was the first King of the Visigoths from 395–410, son of chieftain Rothestes. 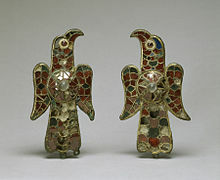 He is best known for his sack of Rome in 410, which marked a decisive event in the decline of the Western Roman Empire. 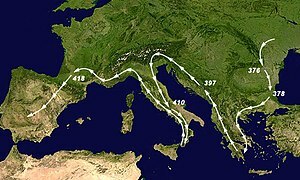 The Migration Period was a period that lasted from 375 AD to 538 AD, during which there were widespread migrations of peoples within or into Europe, during and after the decline of the Western Roman Empire, mostly into Roman territory, notably the Germanic tribes and the Huns. This period has also been termed in English by the German loanword Völkerwanderung and—from the Roman and Greek perspective—the Barbarian Invasions. 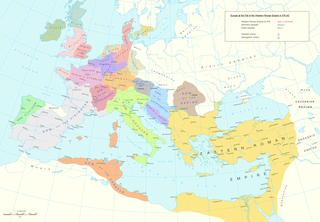 Many of the migrations were movements of Germanic, Hunnic, Slavic and other peoples into the territory of the then declining Roman Empire, with or without accompanying invasions or war. Radagaisus was a Gothic king who led an invasion of Roman Italy in late 405 and the first half of 406. A committed Pagan, Radagaisus evidently planned to sacrifice the Senators of the Christian Roman Empire to the gods, and to burn Rome to the ground. Radagaisus was executed after being defeated by the half-Vandal general Stilicho. 12,000 of his higher-status fighters were drafted into the Roman army and some of the remaining followers were dispersed, while so many of the others were sold into slavery that the slave market briefly collapsed. These Goths later joined Alaric I in his conquest of Rome in 410. 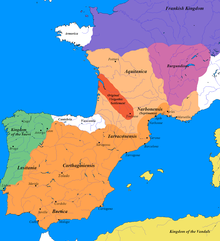 The Ostrogothic Kingdom, officially the Kingdom of Italy, was established by the Ostrogoths in Italy and neighbouring areas from 493 to 553. The Sack of Rome occurred on 24 August 410 AD. 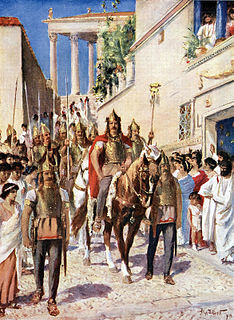 The city was attacked by the Visigoths led by King Alaric. At that time, Rome was no longer the capital of the Western Roman Empire, having been replaced in that position first by Mediolanum in 286 and then by Ravenna in 402. Nevertheless, the city of Rome retained a paramount position as "the eternal city" and a spiritual center of the Empire. The sack was a major shock to contemporaries, friends, and foes of the Empire alike. The Thervingi, Tervingi, or Teruingi were a Gothic people of the Danubian plains west of the Dniester River in the 3rd and the 4th centuries. 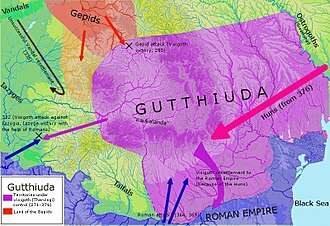 They had close contacts with the Greuthungi, another Gothic people from east of the Dniester, as well as the late Roman Empire or the early Byzantine Empire. 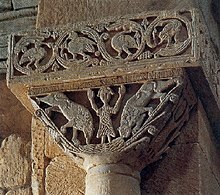 The Greuthungs, Greuthungi, or Greutungi were a Gothic people of the Pontic-Caspian steppe in the 3rd and the 4th centuries. They had close contacts with the Thervingi, another Gothic people, from west of the Dniester River. They may be the same people as the later Ostrogoths.